PEOPLE in Donegal can now access free wi-fi at 25 public buildings throughout the county including Inishowen. The Donegal County Council Public Wi-Fi network is now available in all the public areas of Lifford HQ; Carndonagh Public Services Centre (PSC); Buncrana Council offices; Letterkenny PSC; Donegal PSC; Milford PSC; An Clochán Liath ISP and the Local Enterprise Office, Letterkenny. People can also log on for wi-fi at the Central Library, Letterkenny and libraries in Buncrana; Milford; Carndonagh; Moville; Raphoe; Lifford; An Clochán Liath; Gaoth Dobhair; Donegal Town; Ballyshannon; Bundoran and Ballybofey. The Regional Training Centre, Stranorlar; Waterworld Bundoran; the County Museum & Regional Cultural Centre, Letterkenny. Donegal County Council Public Wi-Fi network. The network will allow visitors to connect to wi-fi services during opening hours and "facilitate access to online e-services, general browsing and a better user experience at the public buildings". The public can log on in libraries using their library card details. Access in the other buildings is via an access code which is valid for one month. To generate the access code you must supply your mobile number and the code will be sent to your phone via a SMS message. 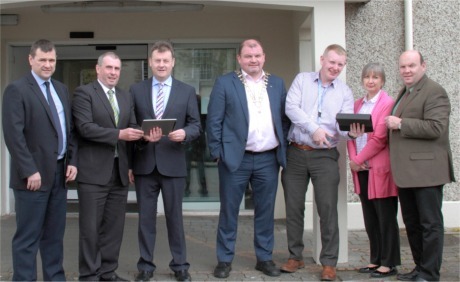 Getting connected: pictured at the launch of the Donegal County Council Public Wi-Fi Service, from left, Sean Dunnion; Brian Boyle; chief executive Seamus Neely; Cathaoirleach Cllr Ciaran Brogan; Daragh McDonough; Eileen Burgess and Garry Martin. The local authority partnered with SORD Data Systems on the installation of the Wi-Fi network.